It seems ages ago now, but back in July 2018 Labone Castleside held an immensely successful celebration and open day to mark their 50th anniversary. As part of the celebration, many suppliers really did dig deep and kindly donated some amazing prizes to be raffled off on the day to raise money for local charities, the proceeds of which totalled over £2500. One such prize was donated by CK Quality, a company providing specialist quality inspection support. Their generous donation was a Ferrari experience day at a local race track. 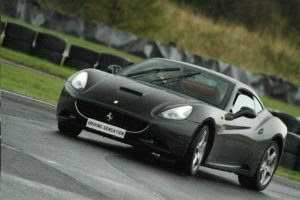 The lucky winner was Don Reed, who is seen navigating the race track just like “The Stig” during his recent experience. Don stated “I couldn’t believe I won such a cool prize! it was certainly a great day which I thoroughly enjoyed, though disappointed they wouldn’t agree to exchange my car for the Ferrari I drove around the track, I could get used to driving that Ferrari”. Don went on to say that “I would like to thank everyone at CK quality for donating such a great prize, thanks so much!”.